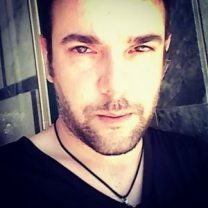 Hailing from Lisbon, Portugal, Hugo is a freelancer Writer, Blogger, Game Designer, Web Designer, Occultist, big kid dreamer and a lot more. Hugo began creative writing for a contest. In 2003, the original Ophidian team back launched a writing contest, and from that time on he became part of the Ophidian creative team. He has been keeping the Ophidian dream alive for over a decade. Back in the day he wrote several official Ophidian 2350 biographies and storylines, and a couple of Fan Fictions set in the Ophidian Universe that received high praise from the community. During that time Hugo also created and released four Print and Play (and highly overpowered) Ophidian 2350 Fan Expansions Sets, and became the manager of all the Fan Works for Ophidian. In 2010 with the introduction of Facebook into Hugo’s life, he ventured into the creation of online games with the most spectacular idea ever… he reshaped the Ophidian 2350 Universe into a brand new Ophidian 2355 RPG Facebook Game. It didn’t go well, as the company that powered the game was shut down, ending this new Ophidian version prematurely only after four months of life. That was only a minor setback, as that new universe was kept expanding even without the game and it lasted until 2014. After that, Hugo was contacted by another original Ophidian team member to create a simplified version of the Ophidian Universe for a Strategic Tabletop Game with cards and 3D printed minis set in the year of 2375. It was something that Hugo could not ignore, so he created a new Ophidian Universe where things diverged from the original timeline while still maintaining the familiar feel of the original. Enter Hack and Slash Games in 2015. Re-opening the Ophidian Arenas, Hugo was contacted to act as a writer and as a Ophidian “Lore” Guru, and he gladly accepted the new challenge. Together with Jason Robinette, Hugo has helped to shape the Ophidian timeline forward into Ophidian 2360 for Hack and Slash Games. He has crafted multiple biographies, lore and is currently developing the upcoming Ophidian Roleplaying Game.